Rich Levels Poultry, LLC is owned and operated by the Davis Family in Galena, MD. 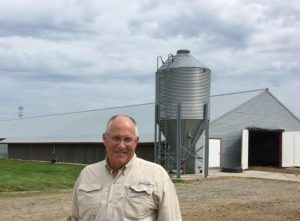 They used their 2017 Kathleen A. P. Mathias Agriculture Energy Efficiency Program grant award to help offset the costs of upgrading their six poultry buildings to be more energy efficient. Allen Davis, pictured, is a sixth-generation member of his family to farm the area around Galena. According to Allen, “these poultry building upgrades help us to remain competitive with all the new poultry house buildings by raising healthier and happier chickens. Our family has been farming this area since the 1850s and our desire is to successfully pass this legacy down to the seventh generation. The Kathleen A. P. Mathias Agriculture Energy Efficiency Program is dedicated to the memory of Kathleen Arlee “Kathy” Petry Mathias of Ocean City, who passed away Aug. 15, 2011 after a battle with cancer. The wife of Maryland State Senator James N. Mathias Jr., Kathy was an inexhaustible advocate for Maryland’s Eastern Shore and its farming community.​​​​​ For more information on the Kathleen A.P. Mathias Agriculture Energy Efficiency Program, contact Dean Fisher at dean.fisher@maryland.gov or 410-537-4068.